We recognize the religious rediscovery of Woman’s mystery in Tantra . As we’ll see later on each beautiful woman who is full of vital energy is the embodiment of SHAKTI – the feminine principle. The Spirit, “The Supreme Male”, Purusha , is “the great impotent”, immobile and contemplative, as the absolute witness. He acts through PRAKRITI , “The Eternal Feminine”, that is the dynamic principle, the one who creates and feeds. When a great danger threatens the Cosmos, Gods appeal to the power of SHAKTI to make it go away. A famous myth tells us the story of how the Great Goddess was born at the beginning of times. “An evil demon, MAHISHA, was threatening the Universe and even the existence of the Gods. BRAHMA and the entire Pantheon of gods asked for VISHNU and SHIVA ‘s help. This Goddess was SHAKTI, who managed to destroy MAHISHA the monster and thus saved the world. Thus the Gods endowed SHAKTI with their powers. She was the Unique Feminine Force, the spring that everything came from at the beginning.” The result was a renewing of a primordial state of the universal power. In Tantra SHAKTI, “the cosmic feminine force”, is raised to the position of Divine Mother who sustains the Universe and all the beings, the multiple manifestation of gods (the angelic entities). It is called UMA , The Virgin, in its primordial hypostasis that precedes the Universal creation. In this case SHAKTI is the highest peak of all worlds, pure and untouchable. Once it manifests the universe, SHAKTI becomes the maintainer of space and time and all subtle and physical worlds. In its final hypostasis she is the destroyer, KALI , the one who absorbs into the divine everything that is incomplete and limited in order to prepare a new Creation. KALI wants to make the entire manifestation to have an evolutionary sense. Tantra goes further and presents the Divine Being as a glorious ANDROGEN – the perfect and harmonious combination of feminine and masculine. In other works the Divine is presented as the SHIVA – SHAKTI couple in ecstatic sexual union with continence . 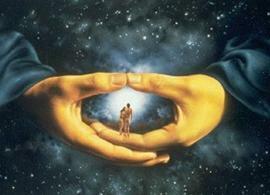 By unifying the man and the woman, by love and transfiguration, they become the divine couple SHIVA – SHAKTI. Thus they can complete one another at all levels of being, creating a Glorious Androgen.